On May 5, 1862, as Confederates clashed with the Union Army nearby, Redoubts 1 and 2 remained silent during the Battle of Williamsburg, the first pitched battle of the Civil War’s Peninsula Campaign (March-July 1862). 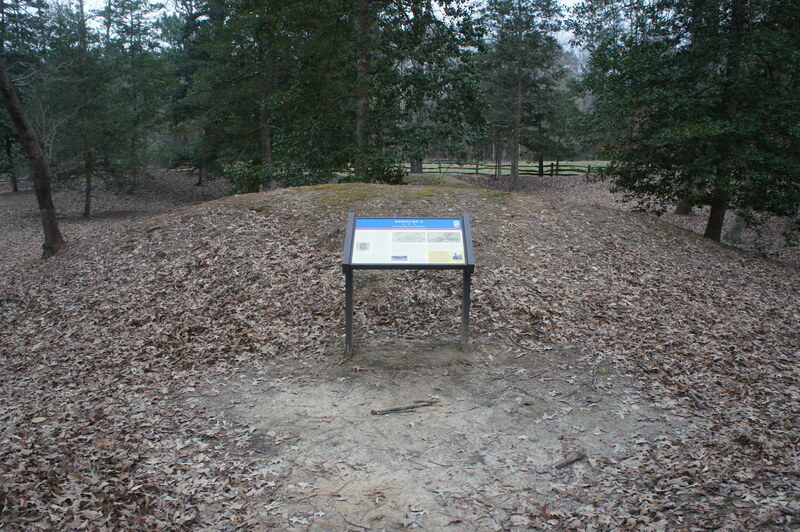 These redoubts constituted the far right flank of Confederate Col. John Magruder’s “third line” of defense on the Virginia Peninsula against Union General George McClellan’s Army of the Potomac—which in spring 1862 was marching at a snail’s pace toward Richmond, the Confederate capital. Today, these two earthen forts are preserved as part of Redoubt Park in southeast Williamsburg. The first is reached by way of a short, paved path; Redoubt 2 requires more of a sense of adventure: a surprisingly steep and winding trail leads through dense forest to the overgrown fortification. Driving down Quarterpath Road from U.S. Route 60 in Williamsburg, Redoubt Park is situated off to the left, just before the road turns to dirt and passes Tutter’s Neck Pond. The Redoubt 1 hike takes off from the west side of the parking area, while the Tuttle Trail to Redoubt 2 heads east. Named for a long-time Williamsburg city manager, the Tuttle Trail immediately plunges into the woods but quickly takes an odd turn in which the dusty path nearly doubles back on itself. 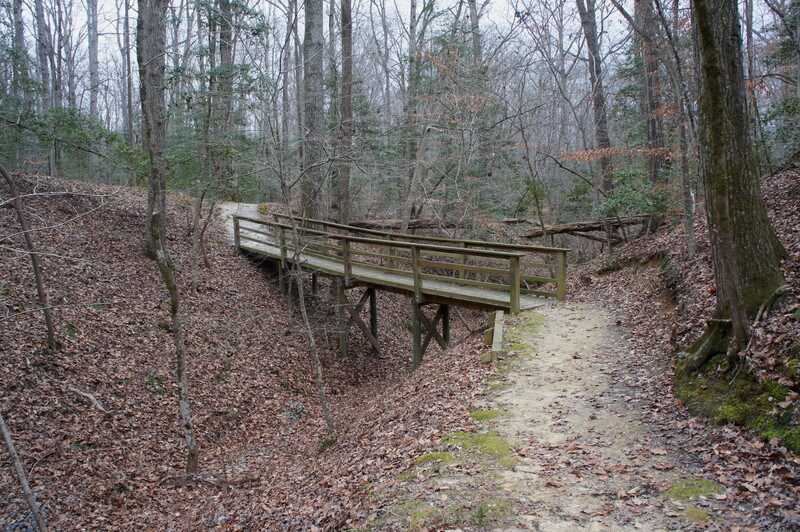 After this initial twist of switchbacks, the trail descends a minor ravine and crosses the first of three wooden bridges at 0.15 miles. From here the trail crests a ridge and then descends a set of stairs to cross a second bridge at the ¼-mile mark. 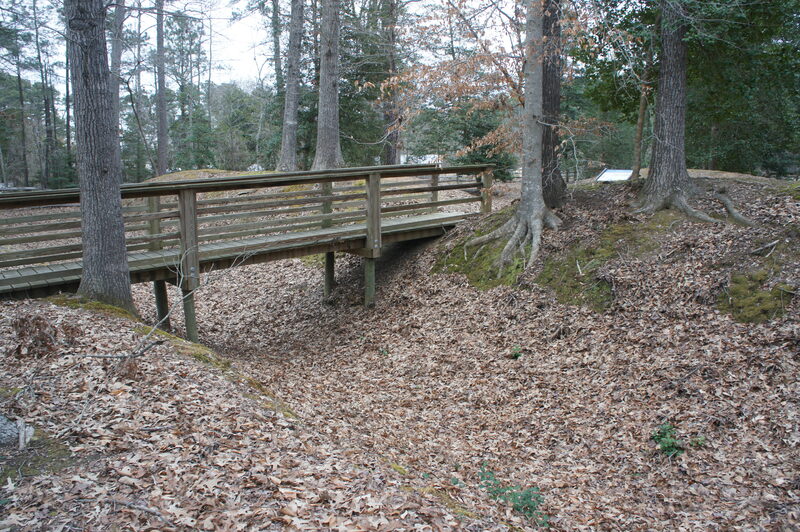 A third bridge follows around 70 yards later, and then the trail climbs sharply before plateauing. The final stretch to the redoubt is relatively level and within earshot of Quarterpath Road to the west. At roughly 4/10 mile, a Civil War Trails wayside provides an overview of the Battle of Williamsburg—an inconclusive fight that nonetheless slowed McClellan’s march toward Richmond—and is positioned at the base of the fort. 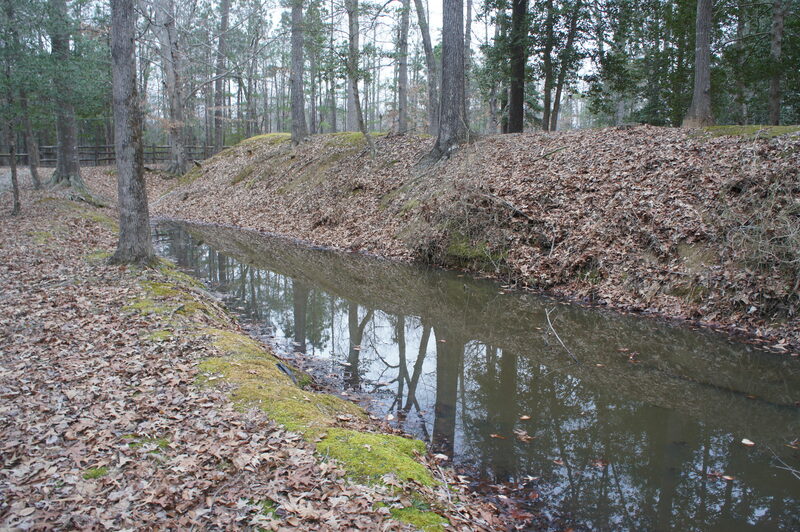 Though incomplete on the eve of battle, Redoubt 2 comprised a relatively significant surface area and an impressive surrounding ditch (which, after rains, doubled as a moat). Bearing left, the trail skirts the edge of the ditch then crosses a bridge to enter the earthworks; here a second sign includes a scan of an old map of the Williamsburg Line—the 14 redoubts comprising Magruder’s third tier of defenses. 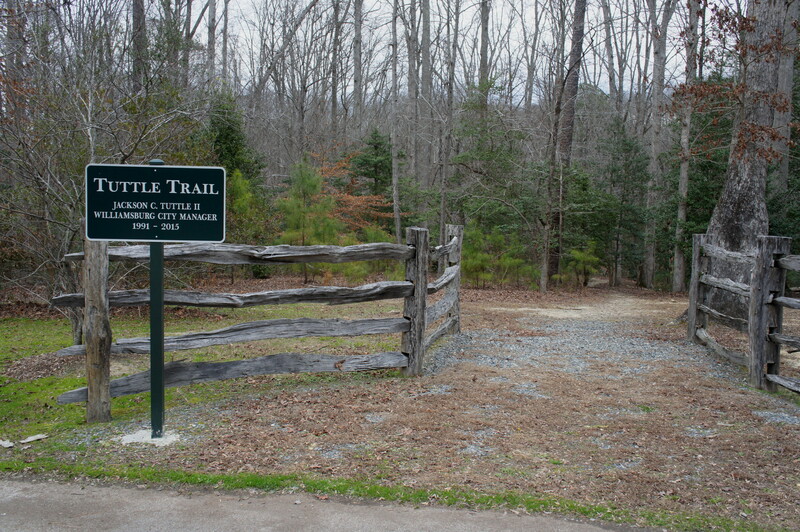 While the redoubt saw no fighting during the war, Gen. James Longstreet’s 17th Virginia crossed Quarterpath Road, just to the north of here, on the day of the battle on May 5, 1862; the regiment was en route to the battle lines at Bloody Ravine. The redoubt also hosted a small battery. After exploring the redoubt, head back the way you came. Allot at least 30 minutes for the round-trip hike of roughly one mile. This entry was posted in Civil War, Hampton Roads, Moderate Hikes, Virginia and tagged Battle of Williamsburg, Civil War, historic, Peninsula Campaign, Quarterpath Road, redoubt, Redoubt 2, Redoubt Park, Tuttle Trail, Virginia, Williamsburg. Bookmark the permalink.